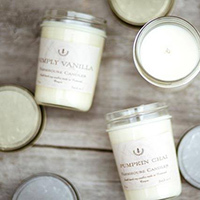 We hand pour our soy candles in small batches and use lead free cotton wicks and essential oils. We hand pour our soy candles in small batches and use lead free cotton wicks and essential oils. We hope you enjoy our long lasting and strongly scented candle!